This is a great potato salad recipe which you can easily combine with fish, chicken or other light meat. You can also use this salad if you are in a lent period, just remove mayonnaise and yogurt from the dressing and you'll get healthy and tasty salad that you can use as lunch. Cook potatoes in boiling water until soft. Drain and cool. You can leave mushrooms fresh or cook a little. 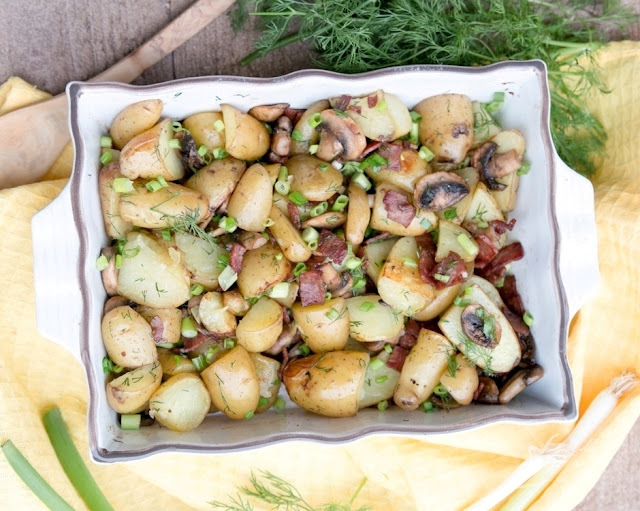 Combine potatoes and remaining ingredients in a large bowl. To prepare dressing: mix all ingredients together. Blend dressing through potato mixture. Serve as meal accompaniment.